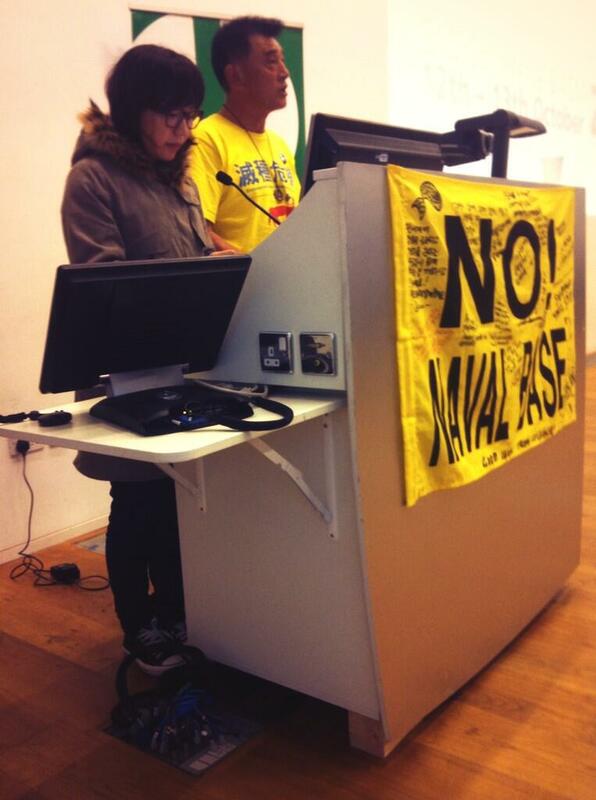 From Oct. 8 to 17, 2013, Gangjeong village mayor has joined the Human Rights defenders’ forum in Dublin, Ireland, as well as traveled London, Leeds and Paris etc. Thanks so much to the organizers of his speech trip in Ireland, UK, and France. I am Dong-Kyun Kang, the Mayor of a small village called Gangjeong in Jeju. I am so grateful for this opportunity to speak to you. It’s very meaningful. So far, I’ve heard many stories from around the world which make me very scared and worried for our descendants. Given that fresh spring water is such a precious and scarce resource on Jeju island, the 450 year old village of Gangjeong situated in the southern part of the island was always the envy of other villages as its possession of an abundant spring water supply which always flowed freely ensured it was always ranked first among Jeju’s villages. 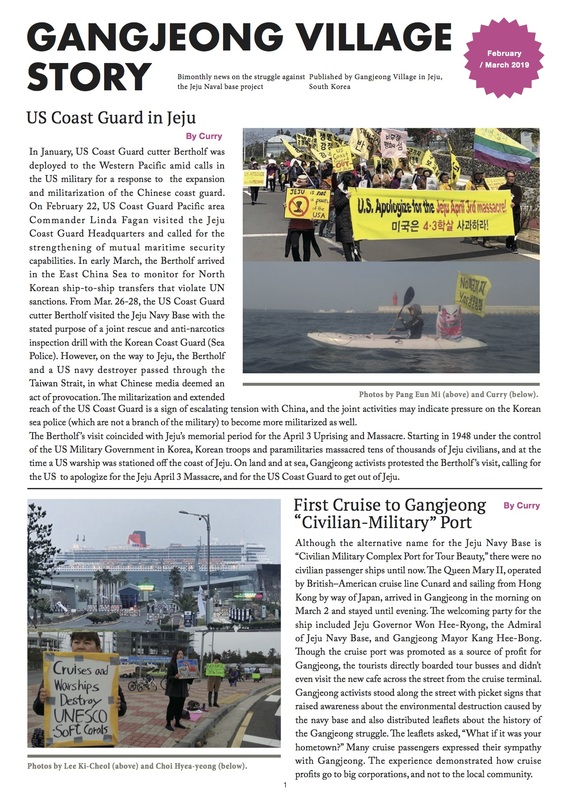 During the construction of the naval base, many international activists have visited Gangjeong and others in the process have been denied entry and deported. Other peace activists have been prevented from leaving the country. I’m keenly aware and saddened that many have suffered from many forms of repression and for their sacrifice I feel so grateful and promise to stand with you in solidarity. You’ve now seen that in recent history there have been two major events in Korea – in 1948 and 1950. As you are aware there was the major upheaval of the 1950 Korean War which broke out in June 25 – a tumultuous national tragedy. One could be forgiven for thinking that this was a family feud that led to the country being divided but the reality was that the war was the result of an ideological battle between the major powers at the time and Korea was its victim. This continues until the present time. The April 3, 1948 Jeju uprising led to the brutal suppression of the population by state security forces which resulted in the massacre of the islanders of Jeju and behind the slaughter was the US government, the self-proclaimed keeper of the peace! A conservative estimate puts the number who died from the mass killings at over 30,000 out of a population of 280,000 people at that time. Fortunately, in 2005 President Roh apologized on behalf of the state to the people of Jeju and acknowledged for the very first time the states brutal suppression and massacre of the people of Jeju. He went on to declare Jeju as an ‘island of world peace’. Peace can only be sustained through peaceful means. Peace obtained through force and violent means is not sustainable and in time will be forced to surrender to a larger force or power. However, I believe that dialogue and mutual understanding between people who work together in mutual respect to build a sustainable future is the key to a sustainable peace. The naval base project is a national security project. I think one defines genuine national policy as seeking to put the interests of its citizens and their happiness and genuine well-being first and foremost. Likewise national security is not only about the state’s administration and its military but should seek to ensure genuine human security for all its citizens. Genuine national policy and national security should seek to secure the confidence and trust of all its citizens which in turn forms the true pillar and foundation for its policies. Working together hand in hand with the people should be the central tenet of its policies. The state in implementing its policies should first consult the people who will likely be impacted the most and endeavour to seek the consent of its citizens through due process which is the most important consideration and an important building block of any democratic society. Even with the project underway listening courteously to and reflecting on the opinions of the other is surely important in trying to achieve real cooperation. The need for transparency in implementing state projects is paramount. However, the naval base has been enforced from the beginning without any consultation on the decision making process and devoid of any semblance of transparency leaving the Gangjeong villagers in the dark about what was going on. Those villagers opposed to the base are in the process of having their lands expropriated without any dialogue or due process of consultation. The villagers are completely perplexed and dismayed by the conflict that has arisen in their village with the naval base decision having separated families and divided parents with siblings becoming enemies and yesterday’s friends becoming today’s enemies resulting in the collapse of the community. Together with the mobilization of the police and state power is the major issue of the lack of due legal process and the arrests of over 700 activists, charges having been filed against 400 activists with 25 cases of activists having been imprisoned to date. There has to be a fair way to resolve such conflicts but the legal system and court process has failed to provide this. With the full power of the police state brought to bear on villagers and activists alike it is undeniable that people will get hurt as they are literally being dragged away like animals battered and bruised. However the courageous and brave efforts of so many over the course of a 7 year long struggle are not in vain but are the source of a precious groundwork that is the basis for a bright future for Gangjeong and Korea alike. These continuing efforts will continue to bear fruit long into the future. The majestic natural environment of Jeju is commonly referred to as beauty inherited from the gods and is home to the UNESCO Biosphere Reserve and three UNESCO World Natural Heritage sites. In 2012 The New Wonders Foundation voted Jeju Island as one of the 7 Natural Wonders of the World. In September 2012 the World Conservation Congress opened in Jeju where it was hoped that it would promote the international consensus of Jeju as a ‘World Environmental Capital City’. However, this ideal is being undermined by the destruction of the environment caused by the building of the naval base which is a grave threat to genuine national security. The 7 year long struggle has left many exhausted and bruised after enduring much pain and suffering along the way. There have been moments of despair but the determination to struggle and defend our village and home and pass it on to future generations has been the enduring legacy and mainstay of the struggle and has been a sacred calling. A new hope springs from the end of despair. This new hope comes from people seeking their true human fulfilment as beings living in harmony with nature, living together in peace. Please help us! No Naval Base! Thanks so much for your attention.